Why does PM Modi, who seems emotionless at home, become a serial hugger when he is abroad? A junior minister in the Indian Ministry of External Affairs was to meet an Arab counterpart in his South Block office. He had been advised that he should be prepared to greet the visitor with a kiss on both his cheeks. When the guest arrived, a young officer standing in waiting suddenly realised that this was not a traditional West Asian prince but someone who had been educated in the US who would be more at home with a formal handshake. He waved a warning to the minister, signaling that the cheeks must not be touched. He then clasped his hands together to suggest that a handshake would do. Nodding in affirmation, the minister grasped the visitor’s extended hand with great gusto and then bent down to kiss it on both sides! Prime Minister Narendra Modi too does not seem to believe in mere handshakes where diplomacy is concerned. He has greeted many foreign heads of states with an impromptu hug. This has often take his counterparts by surprise. One presumes that he has not been advised by his protocol officers to do so. The only world leaders the Prime Minister does not hug are women, e.g. Sheikh Hasina and Dilma Rouseff earlier and Angela Merkel more recently. He reserves only a handshake for them. He could greet them with a peck on the cheek but up to now he has desisted from doing so. Hugging or loving touch, neuroscience tells us, releases a neuropeptide called oxytocin. Hugging excites us and sends out just the right dose of oxytocin to the brain making us happy and comfortable. In children, hugging, cuddling, touching and rough and tumble help them grow into kind and compassionate adults. Or, so psychologists tell us. They also tell us that hugging in couples leads to a feeling of well-being and happiness. It lowers blood pressure and the heart rate. Lowering blood pressure is particularly helpful if one is feeling anxious. Hugging also impacts the stress hormone, cortisole, and leads to better sleep. And most importantly, it helps increase one’s social connections and fosters a sense of belonging. How should one understand Prime Minister Modi’s attempts to get into a bear-hug with world leaders? Is he trying to get the right dose of oxytocin to feel at ease with Vladimir Putin, Barack Obama, Francoise Hollande, Shinzo Abe or Emmanuel Macron? Or is it a sign that he empathises with them and feels happier as a consequence? But the worrying question, is: How does a man who goes on a hugging spree with world leaders keep an aloof distance from his colleagues in India? Modi is the only Prime Minister who when he meets his party’s MPs in Parliament does so in a setting in which he sits away from them; he sits alone on a platform with a single chair for himself. The architecture of power is clear. He is above the rest – and must be publicly seen to be so. Modi’s followers have often tried to style him as “Chhote Sardar” or smaller version of India’s first Home Minister Sardar Vallabhbhai Patel – or they did so till the time he became Prime Minister. According to an apocryphal story about Patel, also known as the ‘Iron Man’ of India, he was handed a telegram intimating him of his wife’s sudden death when he was arguing a case in court. He is said to have read it, folded it and kept it aside, and continued his arguments in court. This incident is often quoted as ‘proof’ and a sure sign of Patel being a strong man. Strong men in India don’t show emotions. And nor does Modi, one would presume, if we set aside the one time he choked and got teary-eyed when asked about his mother in a televised interaction with Facebook CEO Mark Zuckerberg in September 2015. He seems to resist displaying any public attachment. He is projected as the ultimate Alpha Male in India – emotionless, impervious to grief, pain and insecurity. Nobody in India has seen Modi hugging a child, a riot victim, a farmer, a tribal or anyone suffering. There are, however, pictures of him hugging Ayurveda tycoon and yoga teacher Ramdev, Business magnate Mukesh Ambani and even LK Advani before he did him in politically. History teaches us that not all hugs are meant to signal trust and acceptance. Some are just political – Shivaji after all had also once held Afzal Khan in a bear-hug which turned out to be fatal for the latter. So why does why does Prime Minister Modi, who is chary of displaying emotions in India, become a serial hugger when abroad? Could it be that while the Prime Minister feels that he has already beaten the competition in India when it comes to braggadocio, electoral success and public perception of superiority, he cannot establish the same hierarchy when he stands shoulder to shoulder with the leaders of the first world? 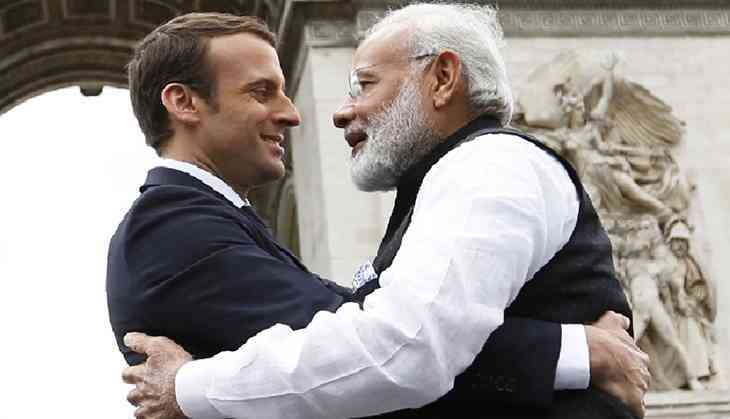 So, for example, he gratuitously referred to his bond of friendship with 'Barack' during President Obama's visit to India and he chose to hug the 39-year-old Emmanuel Macron when he met him for the first time last week. The Prime Minister does not seem to understand that with world leaders emotional lines are pre-drawn – there is little or no possibility of close friendships. All of them have emotional fortresses around them which cannot be breached by a head of state of another country. Their self-image is not threatened when someone of similar status hugs them. They may concede to it believing that the person initiating the hug needs to feel accepted. In the end, these expansive gestures do little good to Prime Minister Modi’s image even if they release more oxytocin to the brain. Contrary to what psychologists say about the benefits of a warm hug, it is doubtful if hugging foreign heads of states fosters a better appreciation of Indian interests or greater acceptance of India or its Prime Minister. There are bound to be better ways of pursuing India’s strategic interests abroad than through emotionally ambiguous touchy-feely diplomacy. TWEET THIS Narendra Modi's 'touchy-feely' diplomacy with world leaders won't yield anything more than a photo-op Why does PM Modi, who seems emotionless at home, become a serial hugger when he is abroad?